After her trip to Ely yesterday Lynnie has suggested it would be a good place for us to visit today. 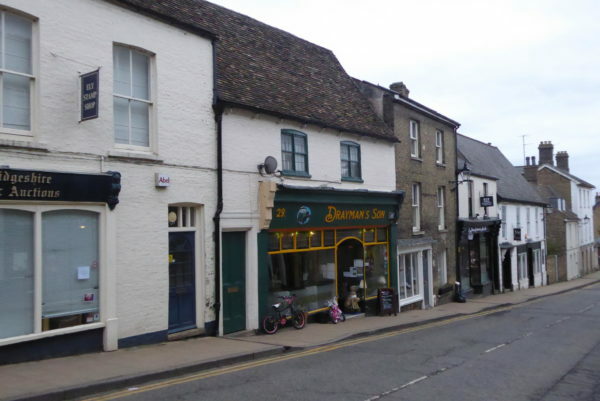 It is usually my preference to visit towns when the shops are closed, so Sunday afternoons and summer evenings work best for me. It’s not that I dislike people, but I like to stop and look at buildings. This is obviously quite annoying to people trying to dash between shops and offices. Ely is in easy striking distance of Little Downham; to be honest I look at the map to see if I can find a circuitous route. However, Lynnie isn’t averse to walking there but wants to take the most direct footpaths. 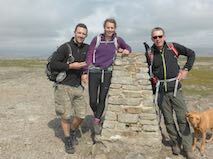 There is an option of walking besides the road, but we opt for a footpath route. Leaving Heatherbield CL we turn left and as we leave Little Downham take a footpath on the right. Initially this is a tarmac driveway but after a gate follows the field edge. On reaching The Paddocks we turn left along Hurst Lane. This is a muddy track and I get the sense that Lynnie is already regretting her decision. Approaching Hurst Farm we stay on the main track as it forks to the left of the farm to reach a minor road leading to the busy A10. Crossing the road with care we carry straight on through a housing estate to reach the centre of Ely close to the Cathedral. To our left is Oliver Cromwell’s House. Lynnie visited this house yesterday and shares with me what she found out. 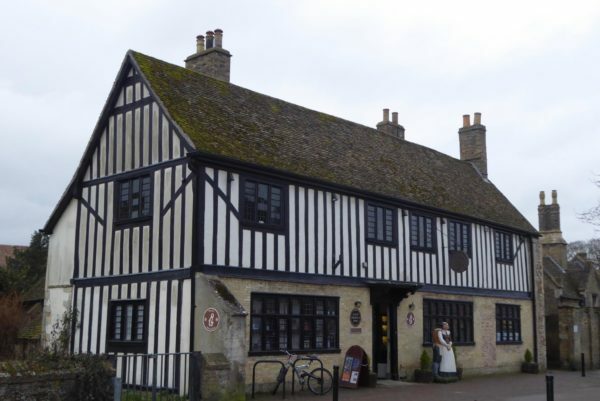 Cromwell lived in Ely from 1636 to 1646 after inheriting a sixteenth-century property, now obviously known as Oliver Cromwell’s House, from his mother’s brother Sir Thomas Steward. His inheritance included the position of local tax collector. 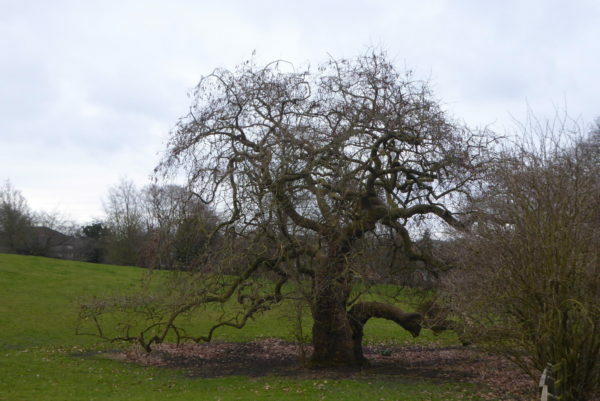 He was a member of parliament and his role in the English Civil War when he was a key figure for the Roundheads is well documented in history. After passing Cromwell’s House we turn right along Church Lane to lead away from the Cathedral. 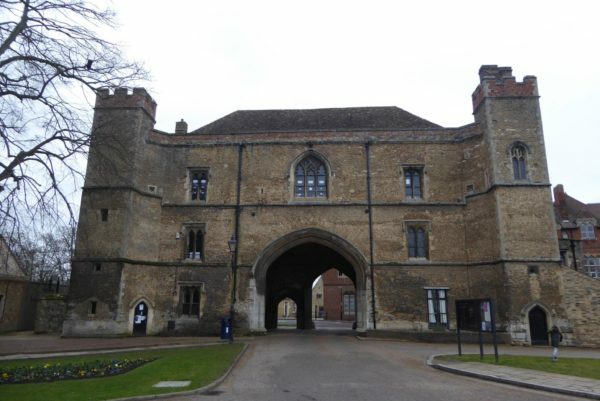 At a junction we turn left along Silver Street and then carry on through the impressive gatehouse to enter Cherry Hill Park. Walking down through the park there are generations out together enjoying the afternoon sunshine. It is Mothering Sunday so many families are together which is good to see. Lynnie points out an interesting tree she spotted yesterday. On reaching Broad Street we cross to enter Jubilee Gardens and walk through this small park to reach the River Great Ouse. Opposite is a marina and the river looks inviting on a day like today. 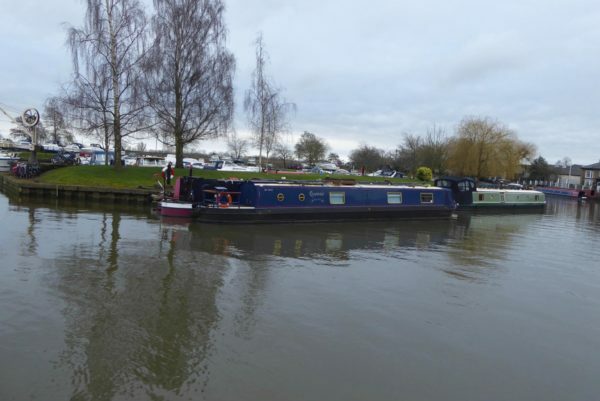 Nowadays the river’s primary activity is leisure but in the past it was an important transport route to Ely across the fens. 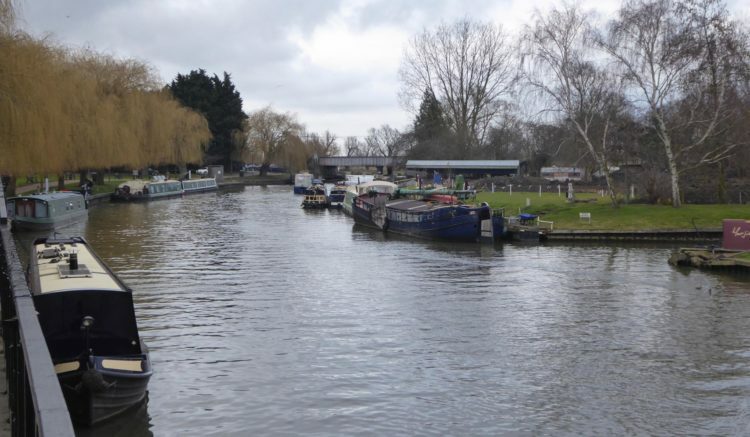 It was via this river that the stone to build Ely Cathedral was transported. 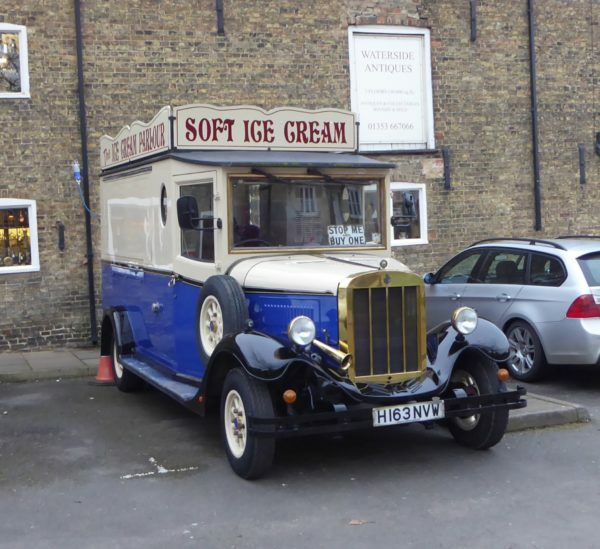 Turning left along the riverbank we pass the Old Maltings and Lynnie spots an old ice cream van, despite the chill in the air she is tempted and pops over to look at the options only to return disappointed because it is closed. We stay on the path besides the river as it heads out of the town and after passing under the railway line we are out in open countryside, now following the Fen Rivers Way. 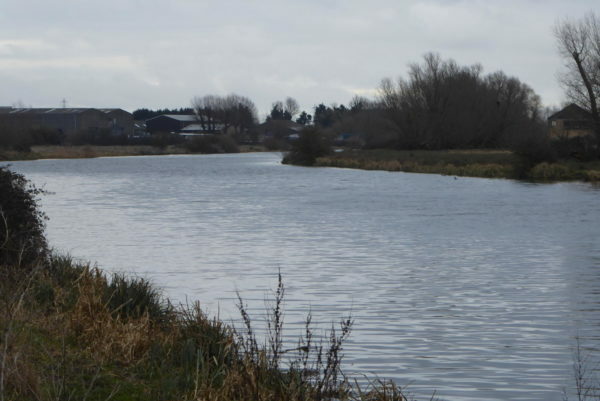 In February 1944 during World War II this stretch of the River Great Ouse was the location for the only Oxford Cambridge Varsity Boat Race to be held outside of London. Oxford were the victors on the day by three-quarters of a length. On the opposite bank is the recently opened Cambridge University Boathouse. On reaching a gate we join a road and cross the railway line, ‘Stop, Look, Listen”, and then take a way-marked path on the left, Springhead Lane, which leads back into Ely. Entering the town by a newly developed retirement complex we turn left along Lisle Lane and then at the end right up Fore Hill. Wandering through the town admiring the older architecture we head towards the Cathedral. 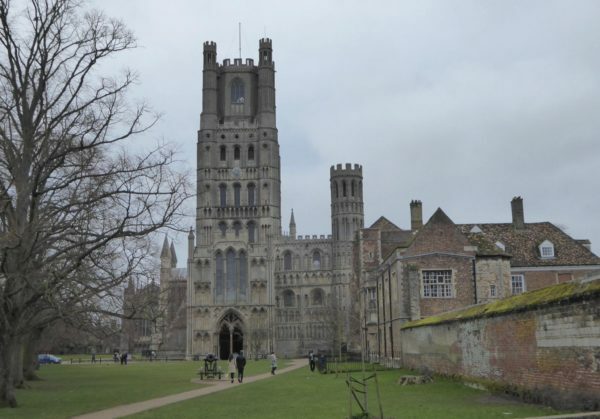 Ely is an interesting place originally an island surrounded by the fens making access difficult and limited. The first abbey built here in 673 was destroyed in 870 by invading Danes. By 970 a new Benedictine abbey had been founded and in 1083 work started on the present building. 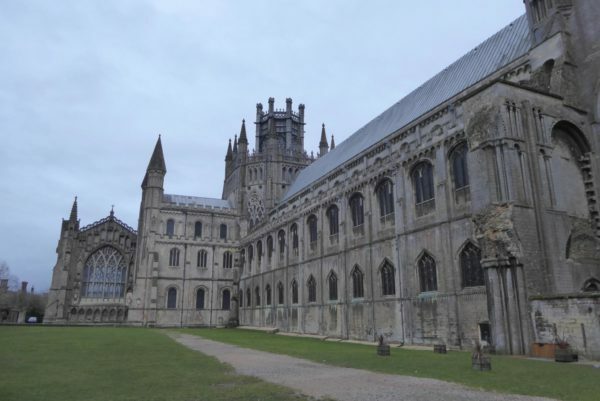 which became a cathedral in 1109. Bits were then either rebuilt or added over the centuries to create the impressive structure that stands today. 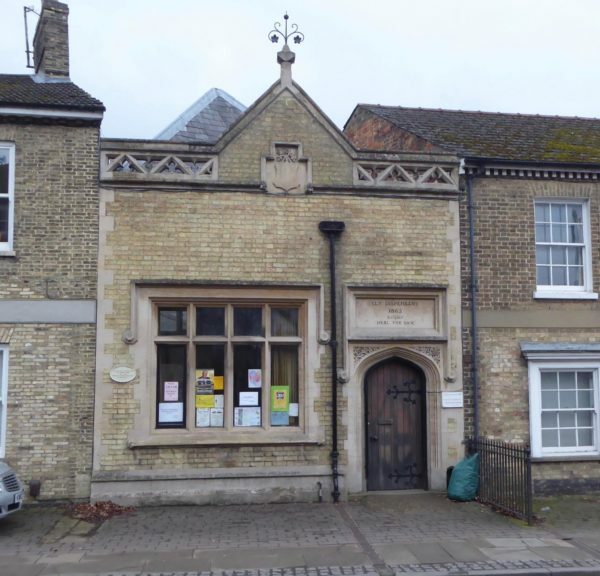 Around Ely there are a number of plaques headed ‘ The City of Ely Perspective’, on the cathedral green there is one to the Reformation Martyrs, which states “Near this place on 16th October 1555 William Wolsey Constable of Welney, Upwell and Outwell. Robert Pygot, Painter from Wisbech were burnt at the stake for their Christian faith”. We head out of town along St Mary Street passing the Old Dispensary with its plaque to Mary Elizabeth Blanche Clark, Ely District Nurse 1907-1939; British Red Cross Commandant in World War II. On reaching Downham Road we turn right and follow this out of town. We have decided to avoid the muddy route we came on, taking the pavement back alongside the Downham/Ely Road. After going under the A10 we enter a major food retail park with all sorts of takeaways on offer. 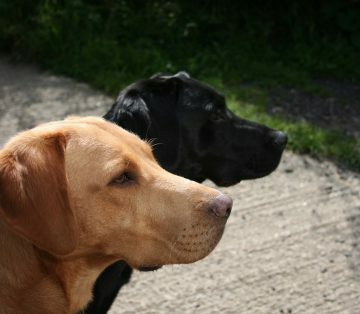 This is an absolute delight for Dexter and Crosby as they seek to hoover up any discarded chips. Joining the pavement by the road we head back towards Downham. The amount of litter strewn in the hedgerow is unbelievable. We usually try to pick up litter as we walk around. Here it would require an army of people and a couple of skips to clear the verge. Disappointed in the way some of our fellow humans show total disregard for the countryside we walk along, I mither about the situation whilst Lynnie tries to find a solution. I think a combination of fines and community service for offenders, but enforcement becomes the issue. So it must be about education and teaching people respect for nature. Lynnie also favours a levy on take out food that is given directly to the Local Council to fund the clean up. Arriving back at Heatherbield CL we have covered just over eight miles, a good stroll for a Sunday afternoon with plenty of interesting things to see. 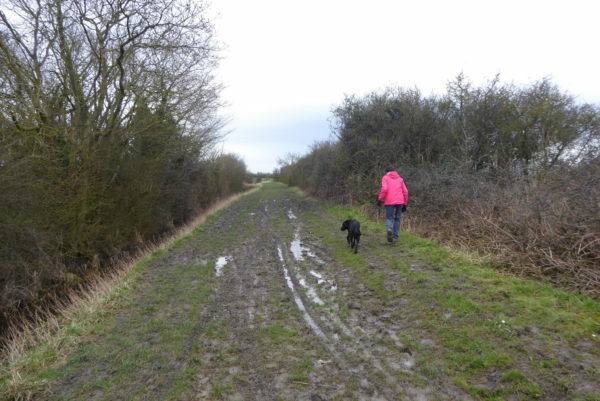 Somehow I think I might be walking on my own tomorrow, Lynnie is not taken with the muddy state of the tracks at the moment and is talking about a trip to do a tour of Ely Cathedral.